Members of the St. Paul Federation of Teachers yesterday delivered a powerful message of unity in their drive for a contract that delivers the fully funded, racially equitable schools St. Paul students deserve. Parents and working people in the district, meanwhile, delivered a message of their own: It’s time for the school district to start listening to educators. They included Teamsters Local 320, which represents more than 100 Nutrition Services workers in the St. Paul Public Schools. In a letter to the school board and administrators, Secretary-Treasurer Brian Aldes noted that teachers stood “shoulder to shoulder” with Local 320 member fighting for a $15 wage floor last fall. Presidents of the St. Paul Regional Labor Federation, the Minnesota Nurses Association and the Minnesota Association of Professional Employees weighed in with letters to the district as well. Together, the labor groups represent more than 80,000 union members. SPFT held its strike-authorization vote at a downtown hotel yesterday, drawing participation from about two-thirds of it 3,700 members. The union represents three bargaining units in negotiations: community service professionals, educational assistants and teachers and licensed staff. All three overwhelmingly backed strike authorization, with over 80 percent support. The union planned to file notice of members’ intent to strike today, and a work stoppage could begin as early as mid-February. The two sides have scheduled a return to mediated talks tomorrow. Teachers said they will continue to push for smaller class sizes, restorative practices, support for English language learners, more nurses and librarians and other measures aimed at improving student outcomes and tackling racial disparities. 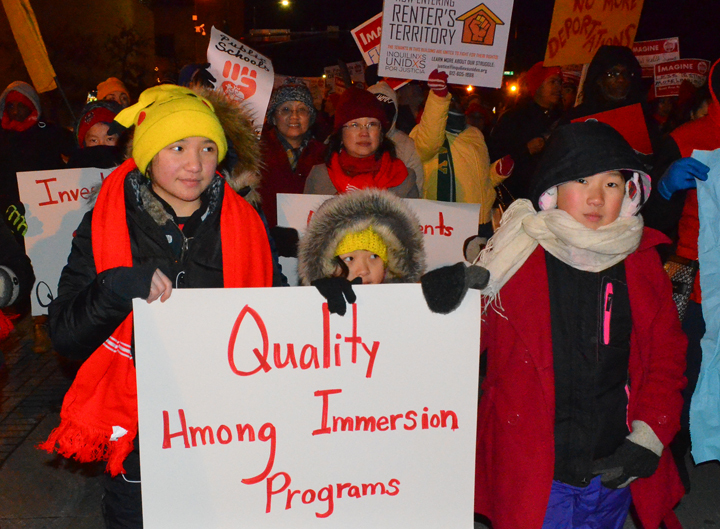 Support for language programs is among SPFT’s core bargaining proposals. Teachers also aren’t giving up on efforts to build new partnerships with corporations like Ecolab and U.S. Bank that avoid paying property taxes in St. Paul, as well as large nonprofits like Allina Health and Macalester that benefit from property-tax exemptions. Parents like Kirinda Anderson, whose daughter attends Wellstone Elementary, want the district to team up with teachers and get serious about holding corporate tax-dodgers accountable for draining resources from public schools.